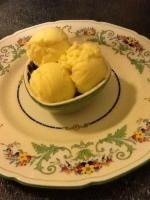 Olive Oil Ice Cream, Seriously! 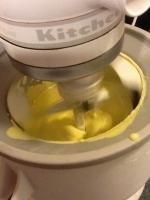 Do you remember last summer when I attempted sweet corn ice cream and it was an epic fail? It failed for several reasons. I think I overcooked the custard and I made a huge error stopping the churn to add the thick batter. When you stop a churn there is no starting it again until the chamber melts because it is literally frozen solid. Last week I was at D’Avolio stocking up on some olive oil and vinegar and store assistant Karen and I brainstormed about fun ways to use their products. She showed me a recipe online (linked here) http://desertcandy.blogspot.com/2007/08/day-12-olive-oil-ice-cream.html and I decided to redeem myself. The first thing I did was decide on which olive oil flavor to use. The possibilities are endless but I finally choose blood orange extra virgin olive oil because I hoped it would taste like gelato, the single best thing I ate in Italy (and that’s saying something). 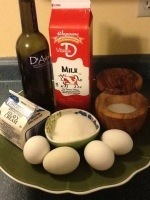 This recipe calls for whole milk, heavy cream, extra virgin olive oil, sugar, egg yokes and a dash of sea salt. I followed it religiously but can already think of ways to change it up. I normally like smooth ice cream but bits of orange peel folded in at the end would be great with this oil. I am going to make lemon next and add the candied lemon peel I made from the peels I used to make lemoncino (clever, no?). 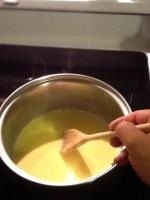 To begin the process you make the custard by heating the milk and tempering the eggs. This method assures you do not have scrambled eggs rather than smooth custard. This part requires the most concentration and you have to enter the kitchen bubble to stay focused. There are several secrets I can share with you. First, you know when the milk is ready to temper the eggs (when you add a little very warm milk to the egg yokes to get them used to the heat) when you stick a clean finger into the milk and it feels very warm but not hot that it hurts. Next, when you add the tempered yoke mixture into the pan, whisk vigorously. Last, and this is most challenging for me, use low heat. With low heat you can see the mixture thicken before it boils. Do not boil it because you change the chemistry and the ice cream will not freeze. You end up with pudding … not the goal. This can take 20 to 25 minutes of constant stirring so patience is truly a virtue. After the custard is prepared you pour it through a mesh sieve into a bowl that contains the heavy cream. The custard gets mixed with the cream and the olive oil is whisked in. I put it in the refrigerator to chill overnight and churned it in the morning. 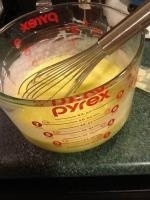 The mixture was thick but realitively easy to get the batter into the vessel without stopping it. This recipe could be doubled because my ice cream maker can make up to a half gallon and this recipe froze to one quart. That is a lot of time for one quart but … was it ever worth it! This is the most delicious ice cream I have ever made. To give you an idea of how good it is, since writing this column there are four spoons in the sink from tasting. Give this one a try and let me know how it turns out.